Although we knew it would be iffy, we had planned this week’s Urban Sketchers Seattle outing for Lake Union Park. That way, if the weather wasn’t on our side, we could duck into the Museum of History and Industry. True to predictions, it stayed dry all day, but that stiff, cold lake wind was more than I could bear. 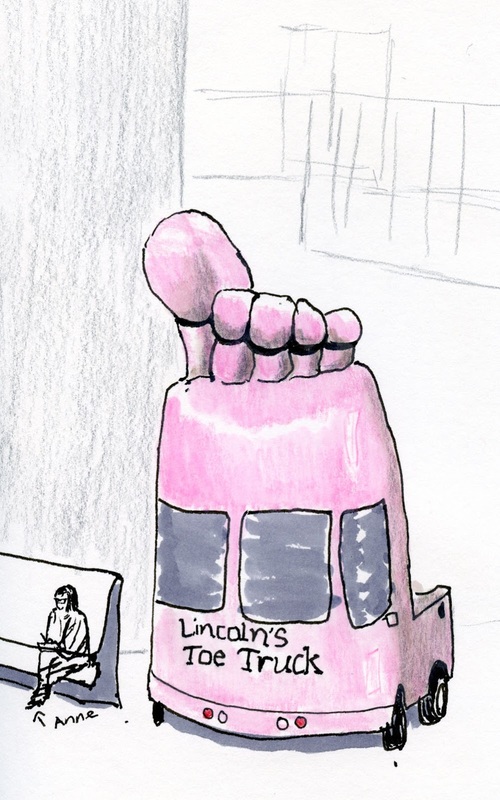 Since I still had my pink colored pencil in my bag from sketching cherry blossoms, I decided to put it to good use once more – on the Lincoln Toe Truck. Pink + nostalgia: Who could resist? It’s one of my favorite old-time Seattle icons at MOHAI. Four years ago when the newly refurbished museum reopened, the Toe Truck was the first thing I had sketched there. 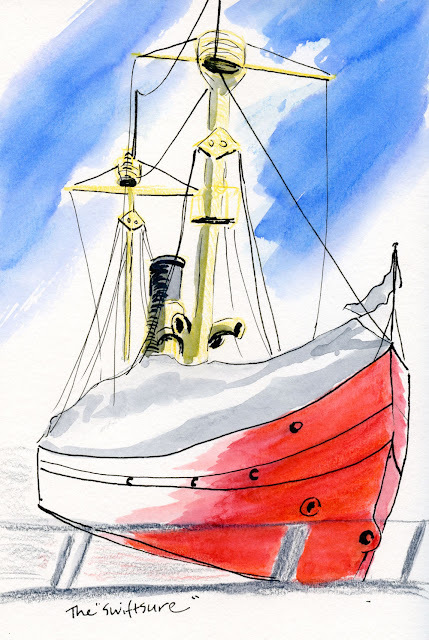 Then a year or so later I sketched it again with USk Seattle. The bitter wind was no warmer by the time I finished, but that bright blue sky was so inviting. . . I wanted to sketch outdoors. I wandered around the museum until I reached the café, where most of the other sketchers had already found cups of coffee to sketch by. I pulled a chair up to a window facing the Swiftsure, the bright red Coast Guard lightship moored on Lake Union. Once again, it was an icon I’d sketched at least a couple of times before – with the Regional Sketchcrawl three years ago and then again when Chandler O’Leary taught an urban sketching workshop in 2015. Although neither icon was new to me, I tried to look at each with fresh eyes. It’s fun and interesting to look back at my old sketches to see how my eyes have changed each time.